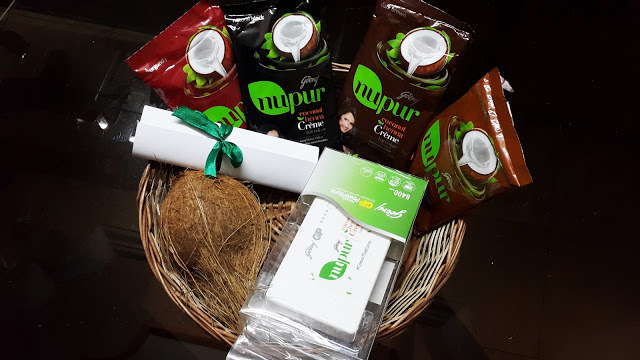 Godrej Nupur team were generous enough to send me their hampers , and to read the “Introduction blog” (click here ) and Godrej Nupur Coconut-Henna Crème is a hair color in a crème format and the package is quite simple but appealing. First Impression: I was sent 4 packets of hair crème with colors – Dark Brown, Natural Black, Natural brown and Burgundy and the one I tried was the “burgundy” one. It is pocket friendly as it only cost Rs.39 per packet with the content of developer and color packets inside. Pre Wash – I started the procedure with cleansed hair and started to mix in the developer and color sachets together and trust me that developer smells “all coconut-ty” which will definitely takes you to the coconut forest. While the color mixture was bit thick but the texture looked really consistent and with “no ammonia” , which was really one of the jackpot in the procedure. amazing abha!! loved your hairs! !